As we mentioned above, this tool is easy to carry — much easier than most similar units we’ve used. 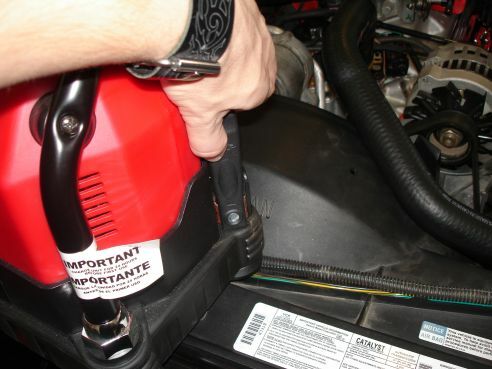 Its feature set is also particularly well thought out, as we’ve used the test unit’s jump start capability and inverter on numerous occasions already. Though we didn’t test the inverter’s total run time, we did power a relatively power-hungry laptop for an hour with no problem. Note: We ran the laptop on-site when working on a project. If you were planning to do this indoors, the noise of the inverter’s internal fan might put you off a bit. It’s loud by “sitting on the desk” standards, but you barely notice it in the shop or on the road. The ‘System’s jump start capabilities are excellent. Over the last few weeks we’ve been working on a particularly stubborn vehicle — which shows a disturbing tendancy to let the battery die suddenly — and having the ‘System in the back meant the difference between walking back to the shop or riding back to the shop. A “reverse polarity” light also makes it easy to see if you’ve got things wired wrong and prevents you from doing major damage. The LED built-in flashlight might seem superfluous, but it’s actually sweet for lighting up the area under the hood when you’re jumping a car at night. 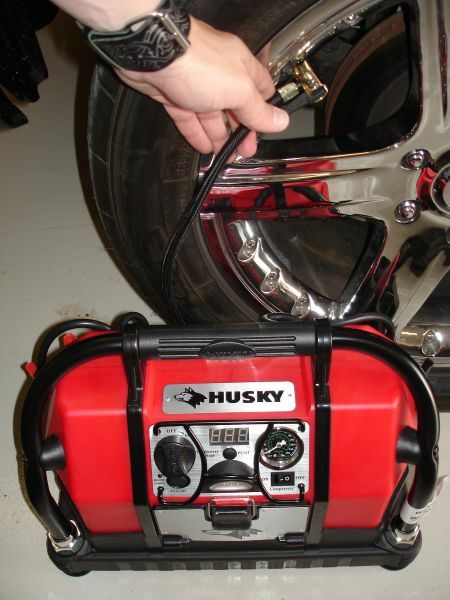 Kudos to Husky’s engineers for thinking about this; Generally, you end up sitting the unit on the fan shroud, which aims the light just about right where you need it — over near the battery. Our only real complaint about the ‘System was its air compressor hose fitting. Ours shipped with a faulty fitting that didn’t mate up well with the fittings found on tires and the like. Note, though, that this was a one-off issue and could easily be resolved with a quick trip back to the store. Once corrected, the air compressor performed well, and the internal SLA provided more than enough juice to run it. Read on to page 3 for our conclusions.